Available from the publisher, here, for CHF 25 / EUR 18 / £ 15 / US 24.95. More images at Tipitin, here. "I became fascinated by Swedish artist-poet Karl Holmqvist (born 1960) as soon as I heard his distinctive voice in this hour-long 2012 sound piece, Untitled (A=T=O=M-I=Z=E=D), on MoMA's website. I was also delighted to see his work included in the exhibition Signs and Symbols at Jessica Bradley Gallery in early 2015. His deep, mannered voice seemed the perfect vehicle to deliver his darkly absurdist words, which cuttingly repeat seemingly ad infinitum, invoking some of the more ignoble facets of popular culture (with a distinctly queer edge) while carrying on some of the language experiments of Dada. Then -- miracle of miracles! -- he appeared at the Art Gallery of Ontario to perform a reading in tandem with their exhibition of the mystical and diaphanous paintings of Silke Otto-Knapp, Land lies in water. I was able to witness the man himself unleash his raspy, rhythmic incantations, perched on the stage at Jackman Hall. 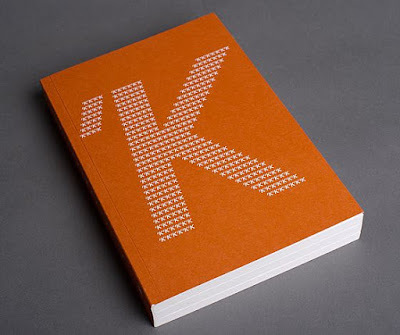 While many audience members -- clearly not realizing what they were in for -- fled the theatre, I was giddily enraptured, and soon went home to purchase 'K (2012), his handsome artist book. The volume collects a number of his brilliant texts, forming a veritable procession of concrete poems. Now whenever I pick up the book I can hear his voice as clearly as in that auditorium." Jon Davies is a Montreal-born, Toronto-based curator and writer. He was Assistant Curator at The Power Plant Contemporary Art Gallery from 2008–2012 and Associate Curator at Oakville Galleries from 2012–2015, where he curated Derek Sullivan: The Missing Novella, on view until 3 January 2016, and Sky Glabush: What Is a Self?, which opens on 17 January 2016. He has written for publications such as C Magazine, Canadian Art, Cinema Scope, Criticism and Fillip, as well as authoring a book on Paul Morrissey's 1970 film Trash (Arsenal Pulp Press, 2009). He also recently co-edited issue 5 of Little Joe magazine and curated the film series Nothing Special: Andy Warhol's Star System for TIFF Lightbox, which runs until 24 January 2015.